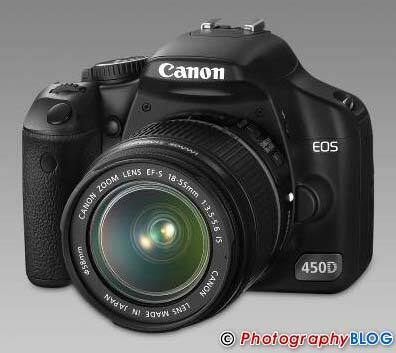 The Canon EOS 450D / Digital Rebel XSi is a new 12 megapixel compact DSLR camera. 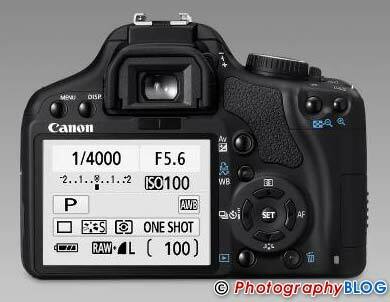 looking very similar to the previous 400D from the outside, the EOS 450D / Digital Rebel XSi features a larger 3 inch LCD screen, new 9-point AF system, 14-bit processing, Live View mode with contrast detection AF mode (like the Panasonic L10) and 3.5fps continuous mode. The Canon EOS 450D / Digital Rebel XSi will be available body only for $799 / £599.99 / €899.99 and with the 18-55mm IS kit lens for £679.99 / €999.99, available from March 2008. Amstelveen, The Netherlands, 24 January 2008: Canon today launches its latest D-SLR, the EOS 450D. Featuring a 12.2 Megapixel CMOS sensor, EOS Integrated Cleaning System, 3.0” LCD with Live View mode and a new 9-point AF system, the model presents consumers with an unprecedented level of image quality and versatility at this end of the market. The EOS 450D employs features already proven in Canon’s professional EOS-1 series cameras, including the DIGIC III image processor and a redesigned menu system that enables features such as direct control of Speedlite flash units from the camera LCD. A choice of 13 custom functions allows the photographer to customise the camera to their shooting style. With all key components developed and manufactured in-house, EOS offers photographers a unique quality advantage. The EOS 450D’s specially designed 12.2 Megapixel sensor employs Canon’s high-sensitivity, low-noise CMOS technology to produce richly detailed images with minimal grain. The DIGIC III processor ensures superior image rendering and rapid response times, with an almost instant 0.1 start up. Image data is processed at 14 bits for Delivering a burst rate of 3.5 frames per second, the DIGIC III processor works with the image buffer to handle up to 53 JPEGs (6 in RAW) without interruption. The EOS 450D is designed to make photography a fluid experience for photographers of all levels and experience. Housed in a compact body that weighs less than 475 grams, the camera features an improved grip design that provides a natural, ergonomic fit with the user’s hands. A large, bright viewfinder makes image composition clearer and more comfortable. The menu system inherited from professional EOS cameras uses a simplified tab structure that does away with scrolling. It includes a user-defined My Menu tab for instant access to frequently used settings. Several custom functions are available to optimise the quality of photos captured in a range of situations. Highlight Tone Priority boosts the dynamic range at the highlight end, providing better tonal detail from wedding dresses, cloudy skies and other bright objects. The new Auto Lighting Optimiser corrects brightness and contrast during image processing, while improving skin tones in portraits by ensuring correct exposure for faces. Photographers can also enable additional noise reduction for shots captured at high ISO speeds. Available for the first time on a Canon consumer D-SLR, Live View mode makes it easier to shoot from awkward angles, such as ground-level macro shots or whenshooting from a tripod. The image from the Live View mode is displayed as a smooth, 30fps video feed on the 3.0” LCD, which is 50% brighter than the screen of the EOS 400D. A grid line display and live histogram can be selected to help with shot composition and exposure. While focusing, the photographer can zoom in on specific details with up to 10x magnification of the image displayed on the LCD screen. Two types of auto focus are available: Quick AF flips the camera mirror momentarily to engage the AF sensor; Live AF uses the image contrast data to focus - a method familiar to anyone upgrading from a compact digital camera. For studio environments, remote Live View lets the photographer compose, adjust settings and capture the shot from a PC using the supplied EOS utility software. The EOS 450D complements its headline features with a host of smaller improvements that enhance the photographic experience. The viewfinder now displays all key exposure information including ISO speed. The addition of spot metering (4% of viewfinder) allows for greater control over exposure in tricky lighting conditions. PictBridge functionality has been expanded so that photographers can correct horizons and add picture effects before printing. A new high capacity battery extends shooting time on a single charge to a maximum of 500 shots. The EOS 450D is supplied with a comprehensive software suite that provides everything the photograph needs to manage and process images. This includes Digital Photo Professional (DPP), a powerful RAW converter that provides complete RAW image processing control. DPP also integrates with camera features such as Dust Delete Data and Picture Styles. The supplied Picture Style Editor software can be used to create custom Picture Styles for fine control over colour display. The camera also comes with EOS Utility, Image/Zoom Browser and Photostitch. Canon Europe is a subsidiary of Canon Inc., founded in Japan in 1937. CCI is a leading provider of digital products for the home and the office, including: photo, video, ink jet and laser printers, All-in-One devices, projectors, scanners and fax machines. Canon’s corporate philosophy is kyosei, a Japanese concept that focuses on living and working together for the common good. As an environmentally aware organisation Canon is a Conservation Partner of the WWF. CMOS Canon’s CMOS technology is one of the company’s key competitive advantages, with noise reduction circuitry at each pixel site delivering virtually noise-free images. In comparison with CCD technology, the lower power consumption characteristics of Canon’s CMOS sensors also contribute to longer battery life. Signal conversion in Canon’s CMOS sensors is handled by individual amplifiers at each pixel site. Unnecessary charge transfer operations are avoided, vastly speeding up the process of getting signal to the image processor. Noise generation is reduced, power consumption is limited and faster frame rate potential is increased. EOS Integrated Cleaning System The EOS Integrated Cleaning System combats sensor dust in three important ways: Reduce, Repel and Remove. 1. Reduce - Internal camera mechanisms are designed to minimise dust generation. The redesigned body cap prevents dust generation through wear on the cap itself. 2. Repel - Anti-static technologies are applied to the low-pass filter covering the front of the sensor so as not to attract dust. 3. Remove - A Self-Cleaning Sensor Unit uses hi-frequency vibrations to shake dust from the infrared filter for a period of approximately one second after each start up. For instant shooting after power up, this feature is disabled immediately the shutter release is depressed. Canon has also developed an internal Dust Delete Data system, which can map the position of visible dust on the sensor. This can then be deleted automatically after the shoot with the latest Digital Photo Professional software. Picture Style Picture Style pre-sets simplify in-camera control over image qualities. Picture Style pre-sets can be likened to different film types – each one offering a different colour response. Within each selectable pre-set, photographers have control over sharpness, contrast, colour tone and saturation. The camera’s factory default configuration is set to deliver immediately-usable JPEG images without need for additional menu settings. Picture Style presets applied to a RAW image can be revised with Canon’s Digital Photo Professional software. - Monochrome – for black and white shooting with a range of filter effects (yellow, orange, red and green) and toning effects (sepia, blue, purple and green). The User Defined Picture Style can be used to store up to three customised pre-sets, or any of the pre-sets available for download from Canon’s web site at www.canon.co.jp/Imaging/picturestyle/file/index.html. Digital Photo Professional Software Digital Photo Professional software provides high speed, high quality processing of lossless RAW images. Processing with Digital Photo Professional allows real-time display and immediate application of image adjustments, giving control over RAW image variables such as white balance, dynamic range, exposure compensation and colour tone. Images can be recorded in camera with sRGB or Adobe RGB colour space. Digital Photo Professional supports sRGB, Adobe RGB, ColorMatch RGB, Apple RGB and Wide Gamut RGB colour spaces. ICC (International Colour Consortium) profiles can be attached to TIFF or JPEG images when converted from RAW. This allows faithful reproduction of colours in software applications that support ICC profiles, such as Adobe Photoshop. For improved efficiency, a set of image adjustments can be saved as a recipe and applied. EOS Utility The latest version of EOS Utility provides essential support for Live View remote shooting, camera configuration and image transfers. Tightly integrated with Digital Photo Professional, EOS Utility can be configured to monitor ‘hot’ folders, automatically renaming and moving incoming images to a structured file system.